Above: Left: The Mausoleum of Zibeyda, one of the wives of Khalifa Harun Ar Hashid. 1190, Baghdad. Right: Azerbaijani scientist Nasiraddin Tusi is buried in the Museyi Kazim Mosque in Baghdad. Not many Azerbaijanis realize that they are closely related to one of Iraq's largest ethnic minorities, the Turkmen. These two Turkic peoples speak the same language and share a common ancestry. Furthermore, several important Azerbaijani revered intellectuals - classical poets and scientists - are buried in Iraq. Researchers estimate that the Turkmen population in Iraq is now between 2.5 and 2.6 million. Since the Turkmen are not concentrated in one central location, however, it is difficult to provide exact figures related to population. Many Turkmen live in one of the richest oil-producing areas of the world in Kirkuk, which is about 250 km north of the capital of Baghdad. The Turkmen settled in Iraq beginning in the 7th century. Wars and the resulting treaties in the area eventually separated the Azerbaijanis living in Iraq and Azerbaijan. Their languages, however, stayed basically the same. For instance, even though Ottoman Turkish was declared as the written language for the Turkmen, their spoken language and folklore more closely reflects Azeri. Azerbaijani, Turkish and Iraqi scholars affirm that Azeri and the Turkmen dialect are very similar to each other. They both come from the same root - the Oghuz group of Turkic languages. Although these two dialects survived a long history without any connection, there are no significant differences between them today. In fact, Turkmen grammar and phonetics is very characteristic of the language of the ancient Azerbaijani epic "Kitabi Dada-Gorgud," ("The Book of My Grandfather Gorgud.") This compilation of legends was set down in writing during the 11th century but contains stories that can be traced back to the 6th and 7th centuries. Dozens of words and expressions that were used in "Dada Gorgud" but are not in use any more in Azeri are still alive and have kept their original meaning in the Turkmen dialect. Several cities and villages found in the Kirkuk region of Iraq bear the same names as ones in Azerbaijan, such as Aghdash, Aghdam, Bilava, Aghsu, Guruchay, Boyat, Garabagh, Garagoyunlu, Amirli, Yayji, Yandija, Mardinli, Uchtapa, Khasa , Khasadaghli Chardakhli. Near the city of Kifri in Iraq, there is a fortress named "Shirvan Galasi" (Shirvan Fortress). 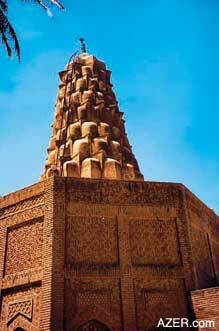 In 1961, this Shirvan fortress was identified as a historical monument of the Turkmen in the map of Iraq. Similarly, in Azerbaijan, there is the 15th-century palace located in Baku's Inner City called the Shirvanshah Palace, built between 1420-1460 where the residency of Shirvanshah state situated that was created during the first part of the 6th century and lasted till 1538 and was managed by the Shirvanshahs dynasty. When Azerbaijani poet Khagani Shirvani (1126­1199) made a trip to Middle East in 1156, he wrote his famous philosophical poem "The Ruins of Madain." His travel notes were compiled in a "safarname" called "Tohfatul Irageyn" (The Gift of Two Iraqs). Today in Madain, only the ruins of the Shah's Palace exist. Nasiraddin Tusi's grave is located in Iraq, in Baghdad's Museyi-Kazimi Mosque. Tusi is buried alongside with Museyi Kazim's grave in Museyi Kazim Mosque. The text on his tomb reads: "This is the tomb of Khoja Nasiraddin Al-Tusi Mahammad bin Mahammad Al-Hasan. He was born on Saturday dawn, Jamadul 11, 597 (Hijri calendar) [February 18, 1201 in Tus, Khorasan, which is now in Iran]. 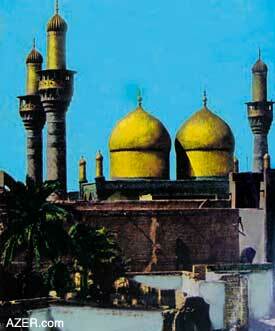 He died Monday evening, Zulhajja 18, 672 [June 26, 1274], in Baghdad. "Pity you, Nasiraddin Tusi!" Another inscription on the tomb reads: "The helper of religion and people, King in the world of Science - such a son had never before been born." Classicall Azerbaijani poet Mahammad Fuzuli (1495­1556) is perhaps best known for his version of the classic love story "Leyli and Majnun." Fuzuli's poetic version of this ancient Arabic legend became the setting for the first opera of the Muslim East, Uzeyir Hajibeyov's "Leyli and Majnun" (1908). 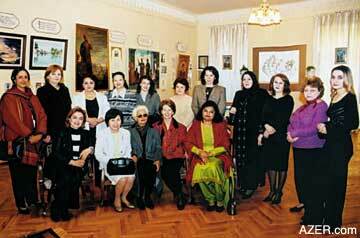 Fuzuli is also famous for two collections of poetry, called "divans", one in Azeri and one in Persian. Fuzuli died in the sacred city of Karbala in Iraq. His tomb was originally located outdoors, near the western door of the Imam Husein Mosque. Later, due to road construction planned for the city of Karbala, the tomb was destroyed (maybe intentionally) and the poet's remains was moved inside the mosque, where it lies today. This was done by order of the Municipality Office of Karbala, which allegedly planned to build a new tomb in Fuzuli's memory. The sign next to Fuzuli's tomb reads: "The poet Fuzuli Baghdadi. Mahammad Bin Suleyman, the poet known by the name Fuzuli Baghdadi was born in  in Baghdad. Some people indicate that he was born in Karbala while others in Hilla. But the most exact place of his birth is Baghdad. He died in . He wrote fine poetry in Arabic and Turkish languages. He spoke Azeri, a Turkic language." Iraqi authorities didn't mention his knowledge and poetry in Persian, due to bad relations with Iran. Another famous Azerbaijani poet, Nasimi (died in 1417), also has a link to Iraq. Famous for his mysticism, as if allegedly flayed alive for his beliefs that God dwelled inside each individual. One of Nasimi's poetic works was titled "Iraqi Divan." In the beginning of the 1970s Seyid Heydar gave a 286-page manuscript of this work to Abdullatif Bandaroghlu, a scientist from Kirkuk province. Heydar considered himself to be a descendant of Shah Ismayil. This manuscript of the Iraqi Divan had been copied by Molla Turab Ibn Molla Safil Ibn Molla Amin in 1853. Gazanfar Pashayev, lived in Iraq from 1962 to 1966 and again from 1972 to 1975. He has written 10 books related to the Turkmen of Iraq. Major works include: "Six Years Along the Banks of Dejla-Farat Rivers" [meaning between the Tigris and Euphrates rivers], "Kirkuk Songs" (Baku, 1973), "An Anthology of Iraqi-Turkoman Folklore" (Baku, 1987; 1999), "Divan Nasimi" (Baku, 1987), "Kirkuk Khoyrats" (Baku, 1983), and "TurkmenProverbs" (Baku, 1978). Baku's Nizami Literature Museum has a Permanent Collection on display of Karkuk-related (Turkmen) material that has been gathered by Pashayev.